Double Sided Hayrack and Manger. 2.4m long x 715mm wide x 1695mm high. 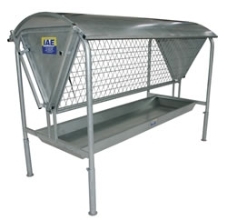 Complete with heavy duty weld mesh hayrack, sheet metal trough and adjustable legs. Delivery charges for this product will depend on your location, quantity ordered and may be free. Please email for details.